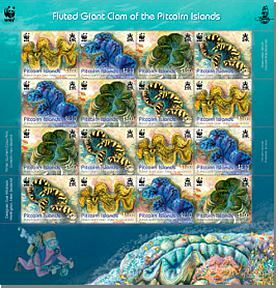 The Fluted Giant Clam, Tridacna squamosa, is one of a number of large clam species native to the shallow coral reefs of the South Pacific and Indian Oceans. It is distinguished by the presence of large leaf-like fluted edges on its shell called 'scutes' which are often used as shelter by organisms such as small crabs, clams and other invertebrates. Normal colouration of the mantle ranges from browns and purples to greens, blues and yellows which are arranged in elongated linear or spot-like patterns. The two-part shell has 5-6 rows of deep open flutes on the valves. The wavy shell opening faces the sunlight, while the hinged side is firmly attached to rocks or coral rubble in relatively shallow water near living reefs. The clam grows to around 40 cms in length and feeds on algae and phytoplankton for its nutrition. By day the clam spreads out its mantle tissue to act as a habitat for the algae to receive the sunlight they need to photosynthesize. Tridacna squamosa does not harm other organisms and despite its ability to shut completely, it faces danger from anemones, trigger fish and puffers which are its natural predators. Man has always valued the clam for food, decoration and aquarium trade and it is this danger which is the more serious, so this beautifully sculptured giant clam is more often seen in undisturbed environments near living reefs. Even though it is a popular food item and its shell is sought after for decorative purposes, the fluted giant clam is being carefully monitored and is currently listed as Lower Risk/Conservation Dependent in the 2004 IUCN Red List of Threatened Species. 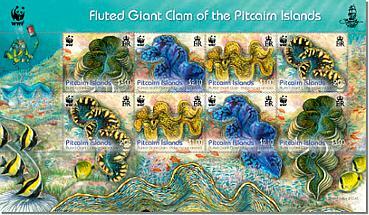 In the Pitcairn Group the CITES classification lists the clam as of low concern. At present it is not under threat and no trading exists which is positive for the Islands especially as in places like Singapore, Tonga and Vietnam large specimens are becoming less frequent and young specimens are only occasionally seen.